Matthieu was the lucky recipient of our biennial award which funds attendance at the Oberlin Violin Makers summer school in Ohio. 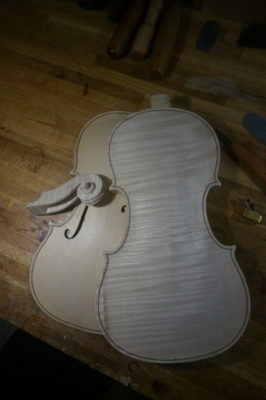 This year I was fortunate enough to be sponsored by the RAB trust to attend the Oberlin Violin Making workshop. This is a world renowned two week workshop held in Oberlin, Ohio. Each year the main focus for the workshop changes as well as the head tutors. 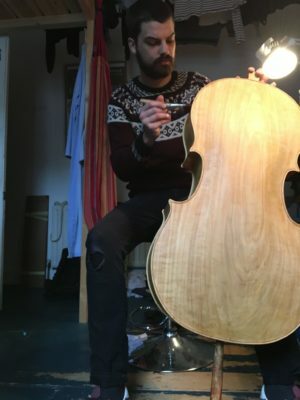 This year the course was led by Philip Ihle and Gábor Draskóczy and was structured around the stylistic features and techniques of late period Guarneri Del Gesu. Before flying to Oberlin I prepared the rib structure, and back and front were roughly cut out to continue at the course. The course was structured around a lecture and demonstration to start the day and was followed by our continued individual work as well as a group project. Apart from the the amount of information provided by the tutors, the other participants of the course were also very accomplished makers. Being able to work alongside so much talent and experience was an unforgettable experience. These participants also conducted talks on topics they were passionate about, which inspired new ideas for my own making every day. The combined skills and years experience of both Philip and Gábor provided an invaluable learning opportunity; I cannot thank the RAB trust enough for enabling me to attend. Living and working amongst so many talented makers was a truly stimulating experience and with the help of the lectures and demonstrations, I was able to complete a front and back plate of the 1740 Ysaye model I had chosen and completed a scroll with a much greater understanding than I had previously before. I would like to thank the RAB trust, the Oberlin organisation, and Christopher Germain for making this all possible.